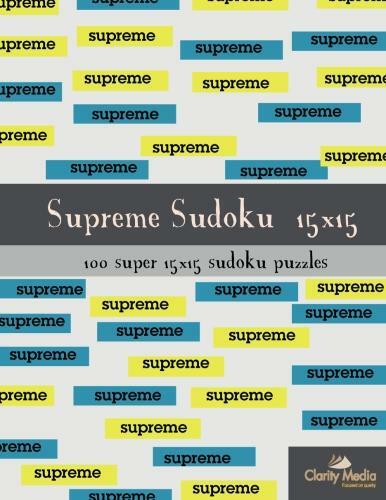 Welcome to this superb collection of 100 brand new 15 x 15 sudoku puzzles. 15 x 15 sudoku puzzles work just the same as regular 9 x 9 sudoku puzzles, but on a larger scale! Infact whereas a normal sudoku has 81 squares in it, a 15x15 sudoku has 225 squares in it. - Place each number from 1 - 15 exactly once in each row, column and 5 x 3 bold-lined box that compose the grid. What strategies are required to solve these puzzles? With our 15x15 sudoku puzzles, you will just need the standard sudoku solving logic: looking at possible values for a square and also where each number can be placed within a region. Thus if there is only one square that can contain the 15 within a region, then you know it must be placed there. Each puzzle can be solved through the above two rules, so you won't need to do anything like look at sets which gets pretty tricky when there are 15 numbers to take into account in each and every region of the 45 regions in the puzzle grid. Most certainly you can! Please click the link above to the samples, and print and play. Print at 100% to see the size of the puzzle on the page too. The books come printed on high quality white paper so are ideal for puzzle solving. What other large sudoku puzzles are available? 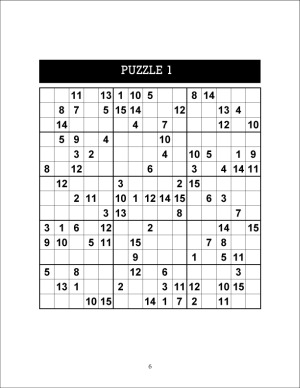 We have a large and expanding range as we hope to offer an unparalleled choice of different sized sudoku grids to puzzling fans all over the world who often struggle to find books containing just the puzzle that they are interested in. Therefore please browse the site via the links to the left and choose from sudoku that are very small at 4x4 right up to very large at 25x25; choose from single puzzle collections right up to puzzles containing 13-grids overlapping!